The Purdue Improved Crop Storage (PICS) bags are a simple and cost-effective way of storing grain and seed without using chemicals to control insect pests. The PICS bag are 50kg. 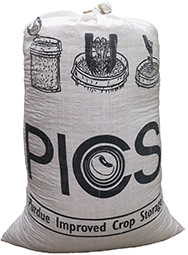 A PICS bag has three layers -- two liners fitted inside a woven sack. PICS enables farmers to store a variety of legume and cereal crops for more than one year after harvest. The PICS technology is helping to improve food security and increase income of millions of smallholder farmers in Africa and beyond. This PICS Video shows how to use the bags for grain storage.